This is my new addition to our garage of motorcycles. Her name is Pink and she is dedicated to Breast Cancer Awareness. I just bought her from my friend who rescued her from a dusty garage. (Painted for a lady rider who quickly decided riding wasn't for her.) When my BFF bought her, she decided due to the color she would ride her in support of the cause. Ironically, my friend was diagnosed with another cancer recently and is moving away for special treatment. After a heartfelt talk, we decided I would take the torch to continue the ride. She will be my commuter bike. Her Australian Registration is "BARBE" as we only have custom plates with only max 5 letters/numbers. When I ordered her - I told BMW that I wanted her have every available accessory installed "you know like Barbie - cause the B*tch has everything" Hence from that day forward she's Barbe. what I have noticed here over the last couple of years is the growing number of women who get pink scooters - as they are now available, together with (finally) pink helmets and clothing now wildly available..
On 8 May - its Mothers Day here and I'm taking her to my next baseball game to help sell tickets for BC as our league for that day gives all monies raised from Bake-Offs, Pink socks (every team wears them)and bbq/canteen, we donate to BC/PRR. 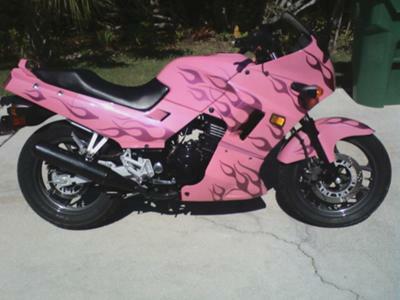 So I think between you and I - Lets start our own global push to get more Pink bikes out there to spread the word.. Thanks for the comment Wendy. I will have to do more research on "pink bikes" and their contribution to B.C. awareness. If you haven't already, please post a picture of Barbe. I just ordered a license plate frame that reads "This ain't no Barbie Toy". Couldn't resist. I'm the only PINK BMW in the world.. and her name is Barbe. She is a F800ST and custom made for me.. 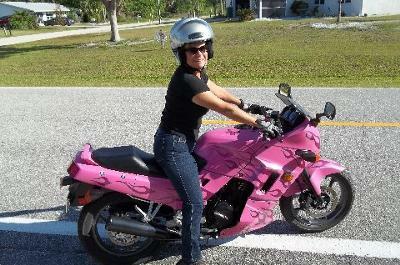 Here in Oz, I give her to Pink Ribbon Rides/Breast cancer foundation to be used as publicity..
Perhaps one day - When I take her to the states.. we will be able to catch up..
Till them.. may your rubber be on the road.